Who uses NASA Earth science data? Dr. Santiago Gassó, to study the concentration and global movement of dust. Research interests: Detection of smoke, dust, and other particles from space and the development of algorithms to derive pollution quantities from remotely-sensed imagery; dust transport at high latitudes and the interaction of volcanic emissions with clouds. Research highlights: Our planet is a dusty place. One estimate on atmospheric dust provided by the National Oceanic and Atmospheric Administration (NOAA) indicates that about 20 teragrams (Tg) of dust are aloft in our planet’s atmosphere at any given time. To put this into perspective, 1 Tg is equal to 1 trillion grams (that’s about 2.2 billion pounds). For comparison, a fully-fueled NASA Saturn-V rocket, the one that took U.S. astronauts to the moon, weighed 6.2 million pounds at launch. Of course, this dust does not simply sit in place. It is constantly in motion and can easily be carried long distances. Depending on the particle size and its height in the atmosphere, dust can remain suspended for several days or even weeks before settling. Developing algorithms to enable satellite-borne instruments to automatically identify, measure, and track atmospheric dust is one element of the research conducted by Dr. Santiago Gassó at NASA’s Goddard Space Flight Center in Greenbelt, MD. In fact, “dust” is a generic term describing particulate matter such as small grains of sand, clays, glacier silt, volcanic ash, and organic debris. It is the single largest component of suspended particles in Earth’s atmosphere. Atmospheric dust also is a type of aerosol, which refers to any collection of suspended particles (such as water droplets, dust, ash, or pollen) in a gas. The amount and type of aerosols flowing in and out of a region or settling in a region can affect a wide range of environmental and physiological processes, including storm development and severity, climate, and human health. Since these airborne particles absorb and reflect light, they can be detected and tracked by instruments aboard Earth observing satellites. Two satellite-borne instruments used by Dr. Gassó in his dust research are the Ozone Monitoring Instrument (OMI) aboard the Aura satellite (launched in 2004) and the Moderate Resolution Imaging Spectroradiometer (MODIS) aboard the Terra (launched in 1999) and Aqua (launched in 2002) satellites. However, tracking dust is tricky. In visible satellite imagery, it can be difficult or impossible to see dust against bright backgrounds (such as clouds or snow) or at high latitudes (due to instrument viewing angles or the lack of adequate light, such as during the polar winter). To make dust easier to see, scientists often use combinations of spectral observing bands to identify dust in false colors. Left image is a Worldview Aqua MODIS True Color image from March 25, 2018 (go.nasa.gov/2uD7YaZ). Dust mixed with smoke can be observed blowing off the west coast of Africa and south of the Sahara Desert, while a thick dust cloud is visible at the top of the image near the Mediterranean Sea. Right image is the same image with an overlay of OMI Aerosol Index data (go.nasa.gov/2GsnYCj). Yellow and red colors indicate areas with higher concentrations of aerosols, which make these areas easier to detect. Both images accessed March 26, 2018, and courtesy of Worldview. For example, the OMI Aerosol Index is a science parameter of the OMI Level-2 near ultraviolet (UV) aerosol data product (OMAERUV; http://doi.org/10.5067/Aura/OMI/DATA2004), and uses processing algorithms to highlight areas of higher aerosol concentrations in yellow and red. Dr. Gassó often begins his observations by looking at MODIS imagery using the Earth Observing System Data and Information System (EOSDIS) Worldview data visualization application, then retrieves OMI data for his areas of interest. He points out that it can be challenging to use these images to estimate aerosol mass since there is no direct relationship between dust concentrations and the optical signals detected by satellite instruments. As a result, complex algorithms are needed to process this information, which results in a parameter called the ambient aerosol optical depth (AOD) that can be compared with model outputs. Much of Dr. Gassó’s work involves creating these processing algorithms and interpreting the data produced by them, such as the effects dust and other aerosols have on clouds or in marine ecosystems. This information is essential for climate modelers, and also is used in air quality studies and forecasts. While instruments aboard Earth observing satellites do a good job identifying aerosol concentrations in the mid-latitudes, these instruments often underestimate—and in some instances are unable to detect—high-latitude dust concentrations (such as dust coming from Alaska, Greenland, Iceland, New Zealand, and Patagonia). Looking specifically at dust from the Patagonian region at the southern tip of South America, Dr. Gassó and his colleagues found that the MODIS and OMI instruments have difficulty automatically detecting dust in the cloudy conditions that often accompany dust storms and similar events. Even in clear conditions, the short-lived nature of Patagonian dust storms causes aerosol concentrations to be diluted, leading to weaker signals for the satellite instruments to detect. The result is an underestimation of aerosol concentrations over this region. This research found that the use of a single instrument (such as MODIS or OMI) is not sufficient for tracking dust at high latitudes. Rather, an integrated approach using multiple instruments and modeling tools (such as NOAA’s Hybrid Single Particle Lagrangian Integrated Trajectory [HYSPLIT] model) can provide more consistent high-latitude dust observations. High latitude dust can also impact the melt rates of nearby glaciers and snowpack by darkening the surface and lowering the surface’s albedo. Albedo is a measurement of the reflectivity of an object. Fresh, bright white snow has a high albedo, and does a good job reflecting solar radiation. Dark snow, on the other hand, has a much lower albedo and absorbs more solar radiation. As dust settles onto snow and glaciers, it can darken the surface and contribute to an increase in absorbed solar radiation. This absorbed energy is returned to the environment in the form of heat, which leads to higher melt rates. Dr. Gassó points out that data for these high-latitude dust studies are limited due to the scarcity of year-round observations and remote sensing data. Dr. Gassó also is studying the role atmospheric volcanic particles play in cloud longevity and evolution. Dust storms, volcanic ash, and pollen are all surfaces on which water vapor can condense to form cloud droplets, which are the basis for cloud drop and rain formation. An increase in particles, such as from a volcanic eruption, generally leads to an increase in surfaces onto which water vapor can condense. Since more cloud droplets in a given space are now competing for a limited amount of water vapor, the cloud droplets tend to remain smaller in size when compared with clouds forming in air with fewer particles. In addition, thin clouds made of smaller droplets tend to be brighter than thicker clouds that form from large droplets. These brighter clouds reflect more incoming solar radiation back into space, which can hinder biological processes (such as photosynthesis) at the surface and disrupt the temperature distribution in the atmosphere. Finally, it takes more time for smaller droplets to become large enough to fall, resulting in reduced precipitation and longer-lived clouds. 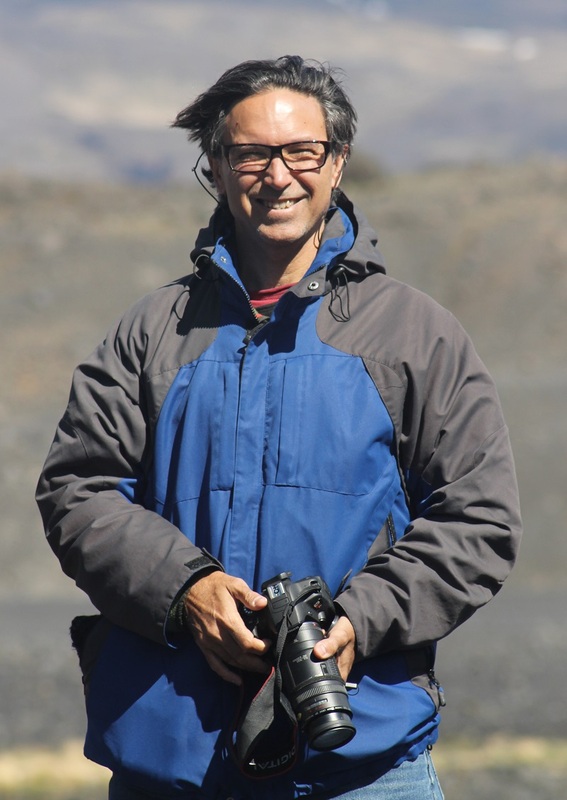 Dr. Gassó’s studies indicate that aerosols from passive or weakly active volcanoes (which often do not receive as much attention from volcano monitoring networks) can disrupt an area’s precipitation and cloud cover by changing how long a cloud persists and how long these clouds are able to reflect solar radiation back to space. While our planet will always have natural and human-created dust swirling throughout the atmosphere, the work of Dr. Gassó and his fellow researchers is helping scientists, health officials, and climate modelers develop a better understanding of where this dust is coming from and where it is going. The result is better knowledge about how our planet works along with more effective dust detection and tracking by instruments aboard Earth observing satellites. Bullard, J.E., Baddock, M., Bradwell, T., Crusius, J., Darlington, E., Gaiero, D., Gassó, S., Gisladottir, G., Hodgkins, R., McCulloch, R., McKenna-Neuman, C., Mockford, T., Stewart, H. & Thorsteinsson, T. (2016). “High Latitude Dust in the Earth System.” Reviews of Geophysics, 54(2): 447-485 [http://doi.org/10.1002/2016RG000518]. Gassó, S. & Torres, O. (2016). “The role of cloud contamination, aerosol layer height and aerosol model in the assessment of the OMI near-UV retrievals over the ocean.” Atmospheric Measurement Techniques, 9(7): 3031-3052 [http://doi.org/10.5194/amt-9-3031-2016]. Gassó, S., Grassian, V. & Miller, R.L. (2010). “Interactions between Mineral Dust, Climate, and Ocean Ecosystems.” Elements, 6(4): 247-252 [http://doi.org/10.2113/gselements.6.4.247]. Gassó, S. & Stein, A.F. (2007). “Does dust from Patagonia reach the sub-Antarctic Atlantic Ocean?” Geophysical Research Letters, 34(1) [http://doi.org/10.1029/2006GL027693].